This temple was built by Kota Jaganatha Swamy in 1969 AD. 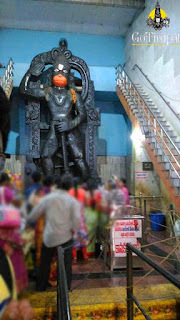 Anjaneya Swamy is of 24 ft tall, 12 ft wide and 4 ft thickness. This statue carved out of a single black granite rock which was brought under the supervision of Bhavanarayana Swamy from Edlapadu near Chilakaluripet. There is a temple for Garuda within the temple complex which is of 30 ft tall, 15 ft wide and 6 ft thickness. Ponnur Anjaneya Swamy Temple is 28 km from Guntur. Hanuman Jayanthi will be celebrated in a grand for 4 days. Thousands of devotees from nearby place throng temple during festival days.